Bike pogies are like super-sized mitts that attach over the ends of your handlebars, including brake levers and shifting mechanisms. They provide substantial warmth and wind protection for your hands, and allow even the most cold-fingered rider to keep pedaling during the frosty months of the year. Most bike pogies are designed to fit over upright handlebars such as those on mountain bikes, rather than the drop-down handlebars found on road bikes (though at least one option is available for this style as well). By adding bike pogies to their cold-weather set-up, cyclists can wear lighter weight gloves than they might otherwise need, which helps improve finger dexterity. Interestingly, despite a seeming increase in the number of cold-weather riders out there, no major gear maker is producing bike pogies; they remain a niche product available from only a few small companies. A pair is on my gift list this year, which led me to a survey of the available options. Here are my top two picks, along with a quick review of other available options. Made from 5.5mm neoprene, Bar Mitts come in a multitude of shapes and sizes designed to accommodate a full range of handlebar and hand/glove types. Given that neoprene is both windproof and waterproof—and that the thickness here is basically the equivalent of what’s used in wetsuits for winter surfing—these seem like they should be plenty warm. The stiffer nature of neoprene also means that the hand opening is more likely to stay propped open, which makes sliding hands in and out that much easier. These made it to the top of my list, due to their reasonable price point ($64.95) and the generally positive reviews they’ve received. 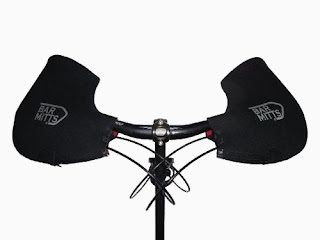 Note also that Bar Mitts provide one of the few options for drop handlebars, though they require your hands to stay in only one position to use them, a significant drawback. These are the pogies you need if you are looking for maximum warmth in the most extreme conditions. They aren’t cheap, but if you do a lot of winter riding in a lot of very cold conditions, these are the Cadillacs of the bike pogie world. Handmade in Fairbanks, Alaska, these heavily insulated pogies are available in both a standard design ($130) and an even warmer Winter Plus version ($170). Dogwood Designs is a small operation—the company doesn’t even have a web site—and sells its pogies through only a handful of retailers, including Fatbike.com and Revelate Designs. Apocalypse Designs, another Fairbanks-based company, offers the Bike Toasties ($84). Fatbikes offers a basic pogie for $60, though it doesn’t seem to be quite the product-for-the-dollar you get with the Bar Mitts. The MEC Northstar Cycling Pogies are by far the most affordable ($35 CDN), though they get mixed reviews, in part due to difficulties getting hands in and out of the floppy fabric. Skinz Protective Gear offers an intriguing (and expensive) take on bike pogie design, with an insulated, wind-proof front and open back for easy handlebar access. Their Heatflex Hand Guards run $149 to $159, depending on style.